Carciofi alla Giudia: Carciofi alla giudìa, literally “Jewish-style artichokes”, is among the best-known dishes of Roman Jewish cuisine. The recipe is essentially a deep-fried artichoke, and originated in the Jewish community of Rome, giudìo being the Roman dialect term for Jew. It is a speciality of the Roman Ghetto, where it is served by Jewish restaurants in spring-time. In English the dish is usually referred to with the standard Italian spelling Carciofi alla giudea. Artichokes of the Romanesco variety, which are harvested between February and April in the coastal region north-west of Rome, between Ladispoli and Civitavecchia, are the best for this dish. Trim the outer leaves of each artichoke. Cut the stem of the artichokes to 2 inches long. In a bowl, combine the artichokes with the juice from the lemons. Cover the artichokes with ice water. Allow the artichokes to rest for about 2 hours. Using your hands, flatten each artichoke to the shape of a flower. Heat the olive oil in a large earthenware pan, over medium heat. Add the artichokes, side by side and stem up. 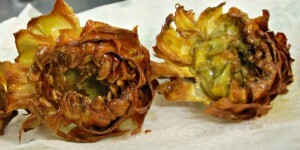 Cook the artichokes until tender, turning the artichokes several times for overall browning. Use a wooden spoon to press each artichoke firmly to the bottom of the pan so that the leaves flatten out. Carefully sprinkle a little water over the artichokes, this will crisp the artichokes. Continue to cook for 2 more minutes. Remove the artichokes from oil and season with salt and black pepper powder. Carciofi alla Giudia is ready to be served. Place the artichokes on a large platter to serve. Garnish the Carciofi alla Giudia with grated Pecorino Romano.